Pirelli art piece at the Blue Tree in Sao Paulo. 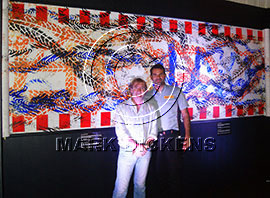 Mark Dickens with Marco Maria Tronchetti, Pirelli F1™ Activation. Mark Dickens and Pirelli invited by The Circuit of the Americas, Austin, Texas to create a new art piece in the downtown fans fest. This event took place during the GP weekend.